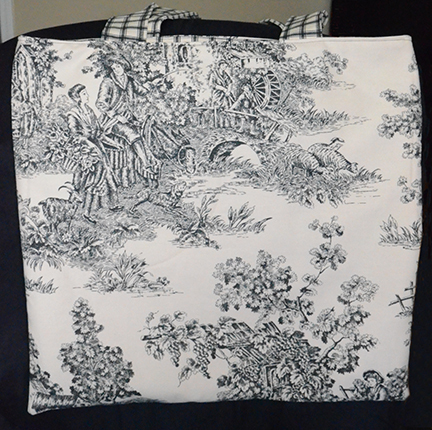 Awhile back, I posted a few pics of some fabric I had purchased to make a new tote bag for work. But since I’m not exactly sure how I want it to look and function, I decided I would take some home decor fabric I salvaged from a too-heavy comforter I bought years ago at Target to use as practice. 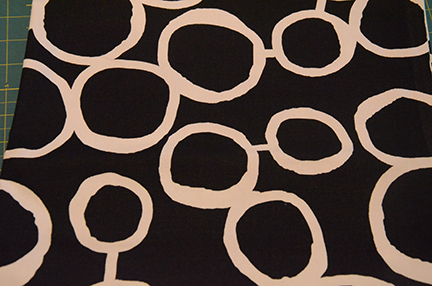 I came up with a pretty simple pattern based on a grocery bag I have. The one I made measures about 19″ wide by 18″ tall. I didn’t box the corners, though I will probably go back and do that later. 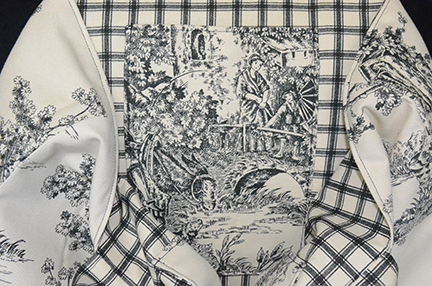 The full-size comforter had two patterns, a black/off-white toile and the same colors in a grid pattern. 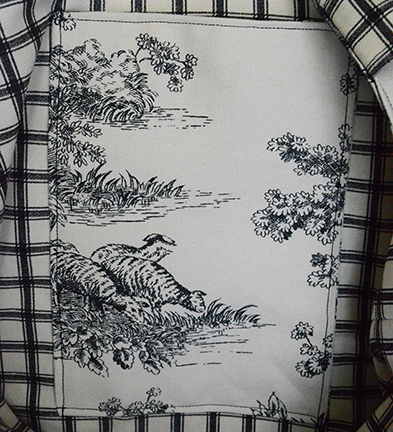 Since I had so much fabric, I didn’t worry too much about being economical with it and fussy-cut it to get a good view of one of the motifs. 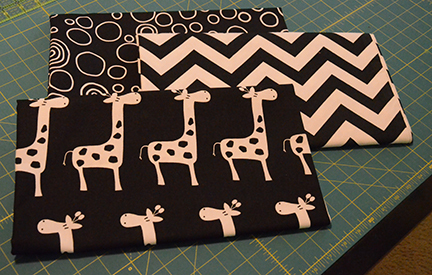 For the lining, I used the grid fabric, but I also wanted a couple of interior pockets. Since this is just a practice bag, I didn’t care about the pockets having zippers. The only thing I did was make them deep enough so my keys or glasses wouldn’t fall out of them easily. And they weren’t intentionally fussy-cut — it just kind of worked out that way. For the black/white graphic bag, I’ll include multiple pockets, both inside and out, and at least one or two will have zippers. 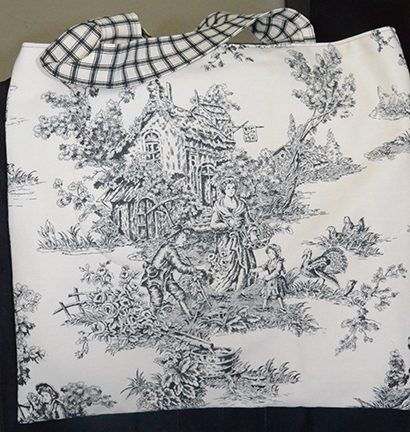 Then the toile (and probably a few more from this fabric) will become grocery bags. I’m going to use my new bag for the first time tomorrow to see if I like the shape and if it holds what I need it to before cutting into the other fabric. If it works out, I can definitely see more of these in my future to give as gifts. Pockets – gotta have pockets! I like this material, it reminds me of some I once made a purse from. I agree, you can never have too many. And I’m looking forward to having easy access ones on the outside for sunglasses and my reading glasses, along with a safe place for my phone or keys where neither will get scratched when I make my next bag. Thanks so much for visiting. I love the tortilla warmers you made on your blog! aw shucks ya make me blush. I love tortillas and these warmers are PERFECT for keeping them moist and evenly heated in the nuker (microwave).